I am in the 4th of July mood already. This My Favorite Things stamp put me in that mood the moment it hit my mailbox! 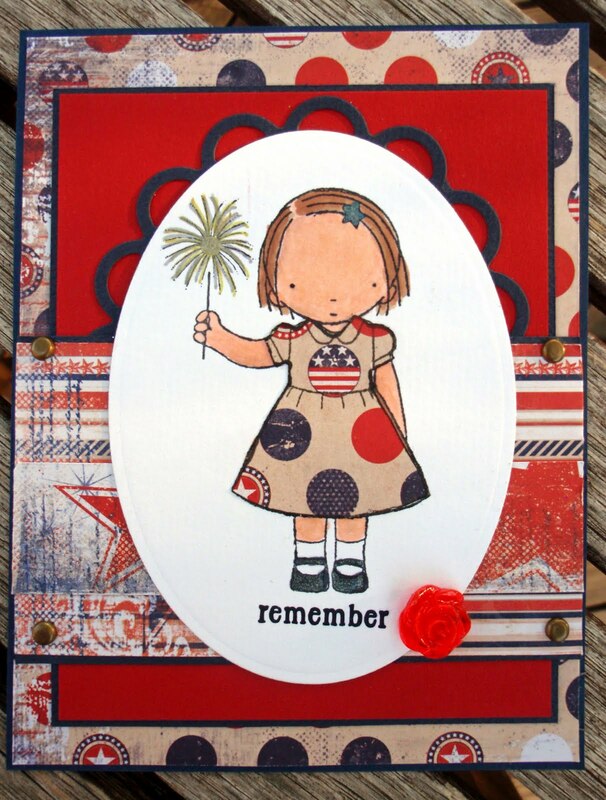 The paper is from Bo Bunny's newest collection and I think her dress is perfect all decked out in this paper. The rest of the image is colored with Copic markers and glitter pens. And that little red rose is a homemade resin flower. I cut out my focal image with a Large Oval die from Spellbinders and then did a little trick with the large Lacy Oval die also from Spellbinders. I cut the Lacy Oval in half and then tucked it behind the striped paper. I wanted the main image to stand out - but I still wanted SOMETHNG behind it. That something turned out to have sort of a halo effect and I think I got the look I was trying to achieve. And now I am in the mood to give something away - so I will give this card away to one of my faithful readers. Just leave a comment here or on Facebook (and then LIKE us on Facebook so you get updates). I will randomly select a special someone to receive this card with an envelope all ready for you to send to a friend of yours. I will post the winner on July 4th. See you tomorrow with the first card for July. And later tonight, I will add all of June's projects to our Facebook page photo album. May's projects are there already. Good morning Susie! 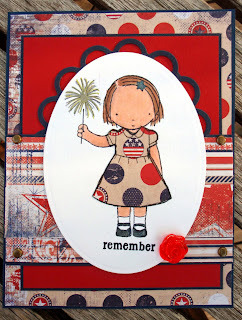 This is really darling and did catch the spirit of the 4th of July holiday! Awesome job! This is adorable. Happy 4th!